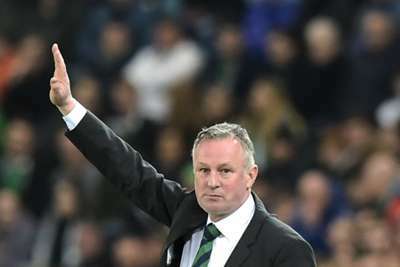 Michael O'Neill wants Northern Ireland to be more 'polished' in the final third after his side beat Estonia 2-0 in their first Euro 2020 qualifier. Niall McGinn's strike and a Steven Davis penalty earned Northern Ireland three points in their Group C opener on Thursday, as they claimed a first competitive victory in nine matches. Profligacy frustrated Northern Ireland throughout their UEFA Nations League campaign, and Paddy McNair missed two gilt-edged chances to make the win more comfortable, with only a fine save from Bailey Peacock-Farrell keeping the hosts ahead before Davis made sure of the points. And O'Neill, who was impressed by his side's patience, acknowledged that Northern Ireland must be more clinical if they are to qualify from a group that also includes heavyweights Germany and Netherlands. "Delighted with the result. It wasn't going to be a straight-forward game, and we didn't score early – Paddy had a great chance and he knows he should score," O'Neill told reporters. "Once you get the opening goal it takes a bit of the tension out of it and the team can start to relax a little bit, and because we didn't manage to get that in the first half Estonia had a bit of belief. "Second half I think we played very well, created opportunities, scored a good goal and deserved the penalty as well. "It was very important [to be patient]. It's difficult having chances and not taking them – subconsciously you think something might go the other way. "But we know as a team we need to improve at times in the final third. The final ball at times, there were some great balls but we didn’t seem to get anything on those. We need to be more polished in the final third. "We just need to threaten more in behind, at times the combination between full-back and winger as well and the final combination and finish needs to be more polished." Northern Ireland face Belarus in their next Euro 2020 qualifier on Sunday, before taking on both Estonia and Belarus once more in June.